The Cloudland basketball team overcame an early deficit and rolled to a 64-49 victory over Sullivan South on Wednesday in their opening game of the Mullins Thanksgiving Classic at Happy Valley. The Lady ‘Landers used five early points from Shian Strickland to hold an early 5-4 lead. However, the Lady Rebels went on a 9-0 run to pull out to a 13-5 lead. Cloudland wasted no time in tying the game with four points from Peyton Johnson and baskets by Kendall Mull and Strickland. Mull ended the half with five straight points to give Cloudand an 18-14 advantage at the end of the first quarter. The Rebels slowly battled back in the second quarter as they limited Cloudland to just one point in the first five minutes of the frame. However Strickland scored five points and Johnson added three more in the final minutes to give the Lady ‘Landers a 26-24 lead at the half. With baskets by Mull and Strickland, Cloudland extended their lead to four points before South trimmed it back to one with just over four minutes to play in the third. A Mull jumper sparked a 10-3 Cloudland run and Johnson’s “and-one” gave the Lady ‘Landers a 44-35 advantage heading into the fourth. In the final quarter, Faith Russell scored four points in the opening minutes, and Mull and Strickland pushed Cloudland to a double-digit lead. 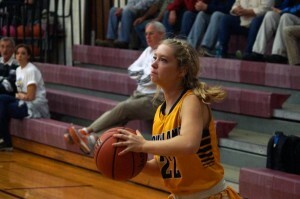 Russell added four straight points at the midpoint to help the Lady ‘Landers take a 15-point lead as Cloudland would preserve the win. Mull finished with 18 points, while Johnson tossed in 17 points. Strickland finished with 15 points. Cloudland moves to 2-1 with the win. For Cloudland Head Coach Matt Birchfield’s postgame comments click here.